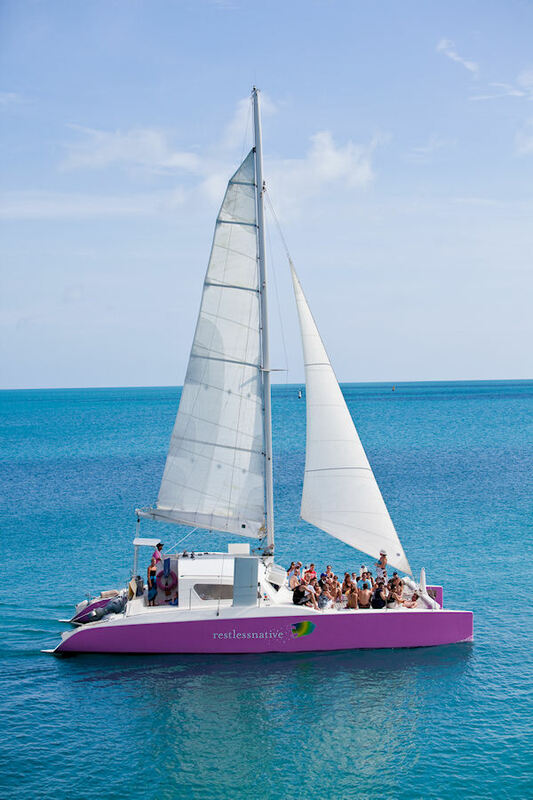 The fun begins the moment you step aboard our comfortable pink sailing catamaran. This is a sailing and snorkeling experience you won't want to miss. Famous for serving warm homemade cookies (baked fresh on board daily!) you'll feel like you're out with family and friends. You'll be served complimentary iced tea and lemonade all day as well as snacks and tasty rum swizzles after your swim and snorkel in a secluded, picturesque shallow water cove. You'll love sunbathing in the roomy hammocks or relaxing in the comfort of the interior cabin with full amenities. You'll be entertained with stories of Bermuda’s history, culture and geology and you will learn more about the underwater world than you could have imagined, including pictures and explanations of the sea life you are likely to encounter. You'll receive clean, high-quality snorkel gear, a guided snorkel tour suitable for all levels of experience and swimming ability, and spend the day with friendly, knowledgeable crew. This tour runs on Tuesdays and Fridays. Don't forget your camera. Bring a towel & swim suit. Must be at least 18 years old to consume alcohol in Bermuda.